There are many different levels and interpretations of obedience training. Sierra Canine offers all levels and types. Please review some of the options that are available below and keep in mind that we tailor our programs to the specific goals and commands that you feel are important to you and your dog. One of the many and most popular programs offered by Sierra Canine is Basic Obedience Training. Basic obedience training is the ground work for a balanced, well behaved and obedient dog. Once your dog has become proficient in their basic commands, we then incorporate them into everyday life at home and with the family. Upon completion of your basic obedience program, everyday life with your dog will be more enjoyable and rewarding. Sierra Canine also offers On Leash Advanced Obedience Training. This training might interest owners who would like to acquire an obedience title for their dog or may enjoy working with their dogs as more of a hobby than just trying to manage control. For those who would like for their dogs to have more freedom, Sierra Canine also offers Informal Off Leash Training. This training allows you to have your dog off leash while still maintaining a safe distance on walks around the neighborhood or park and come consistently when called. This is a 15 month old Golden Retriever that is a student of Sierra Canine. The video demonstrates the results of proper socialization and consistent training using a market based training system in a very busy and distracting environment. This is practical obedience that most pet owners can achieve. This is a 20 month old German Shepherd. The customers’ goal was complete on and off leash obedience in highly distractive environments. Jogging off leash in these environments was also a priority. This is a 10 month old Doberman who is being trained for full off-leash obedience training. This video/lesson was his first exposure to various high level distractions in a park and playground environment. This video demonstrates foundation obedience training with a 5 month old German Shepherd puppy. He is being trained to compete in a working dog sport called IPO/Schutzhund. 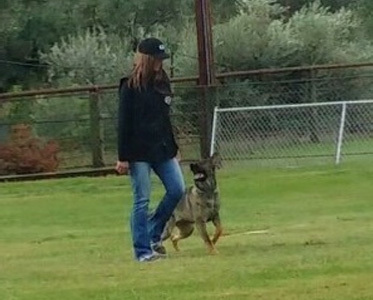 We are mainly working on focused heeling, where the dog must be in heeling position at the handler’s side while also maintaining focus on the handler. There is no leash or correction involved at this stage. This was done using food and a reward based marker training system. Place training or go place is a very popular exercise that can be added to any obedience program. At the completion of this training exercise, your dog will respond to your verbal command to “go place” by enthusiastically running to their place cot. Your dog will be taught that they can do anything while on the cot. They will be able to sit, stand, turn around as well lay down. The only rule will be that he or she must remain on the cot until being released. You will also be able to move a significant distance from the cot while completing various tasks. You can take full advantage of place training by using your cot both inside and out. Below are two examples of place training. One dog was trained to automatically go to his place cot when he hears the doorbell! Listen for the bell at the beginning of the video. The second video is of a fifteen week old Australian Shepherd staying on her cot through various temptations! Due to geographic challenges or that some owners simply do not have the time to commit to weekly lessons and daily practice. Sierra Canine does offer board and train options. Your dog will stay with us in our home for the duration of their stay. Participants must be housebroken or crate trained. As with all of our training, your training program will be customized to the goals that you have for your dog. If this is something that interests you, please make your reservation as soon as possible. Spots are extremely limited. This is Marshall, a fifteen week old Bernadoodle. Marshall stayed for a four week basic obedience board and train program. This video is uncut and is a sample of what commands he was taught. Marshall’s only mistake was that he had to be told to “down” twice. Not bad for a fifteen week old puppy! When I discovered Dennis’ website, I was at my wits’ end with my 2-year-old Welsh Terrier, Austin. Since then, we have completed obedience and leadership training with Dennis. This experience has made such a profound and positive difference in Austin’s behavior and in our lives together, that I feel the world of dog owners should know what a valuable resource he is. He is a hero to our dogs. We hit a milestone today with Rocco. I have been struggling for several months with Rocco and his aggression towards other dogs. Mid April, I was at my wits end and not sure what to do or where to turn. I was searching for something and came across Sierra Canine on Facebook. I did a consult appt. with Dennis. He told me he could help us. We signed up and have had four lessons. I am so very happy to announce we have met our goal today! We attended Bark for Life with Rocco today and he was perfect! I couldn't be more proud of him. Dennis has helped me make Rocco the wonderful dog I knew he was. Thank you, Dennis!! Thank you so much for making Lander be the best dog that he can be! He is such a pleasure now!